Wednesday, February 10th, 2016 | Author: Bunco Betty! Chocolate is always a favorite especially in February. Served with fruit, it becomes a hearth healthy dessert. Not only do we celebrate Valentine’s Day in February, it is also American Hearth Month. Heart disease is the leading cause of death for women in the United States, killing nearly 422,000 each year. Love your Bunco Buds, and bring awareness by hosting a Heart Themed Bunco Night in February. Make a vow to eat healthy, exercise, maintain a healthy weight, be smoke free, and avoid excessive alcohol (except for bunco night) jk. 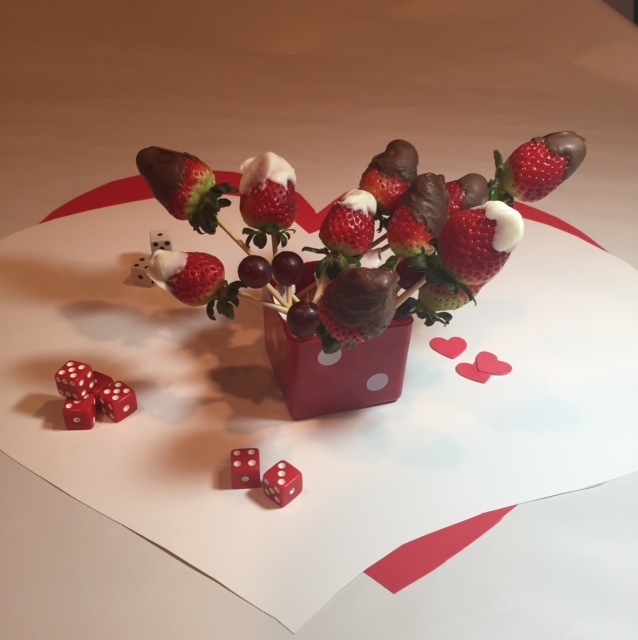 Try this easy heart healthy desert appetizer and celebrate February Bunco in style. Place the dark chocolate and white chocolate in 2 separate bowls and set the bowls over 2 saucepans of simmering water. When melted, dip the pointed end of each strawberry into one of the chocolates and transfer to a sheet of parchment paper. When the chocolate is set, slide the strawberries onto a cookie sheet or large plate and place them in the freezer for a few minutes. After the strawberries have cooled, pierce the large ends of the berries with skewers cut into different lengths. Arrange the strawberries into a dice container, coffee cup, or other serving dish. Serve and enjoy!